Describes the unique needs that ASD students entering further or higher education are likely to have. The author identifies the key skill-sets they will need to develop in order to be successful in college and in life, and shows how they can be helped to develop these. She outlines the skills required for success in further and higher education in relation to the strengths and weaknesses of individuals with ASDs, and explains how those weaknesses can be ameliorated to enable success at college. 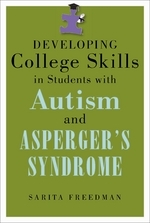 Describing the unique accommodations and support that students with ASD will need, and the skills for which they will need particular help, she provides effective intervention strategies that can be implemented throughout the period leading up to college entrance.